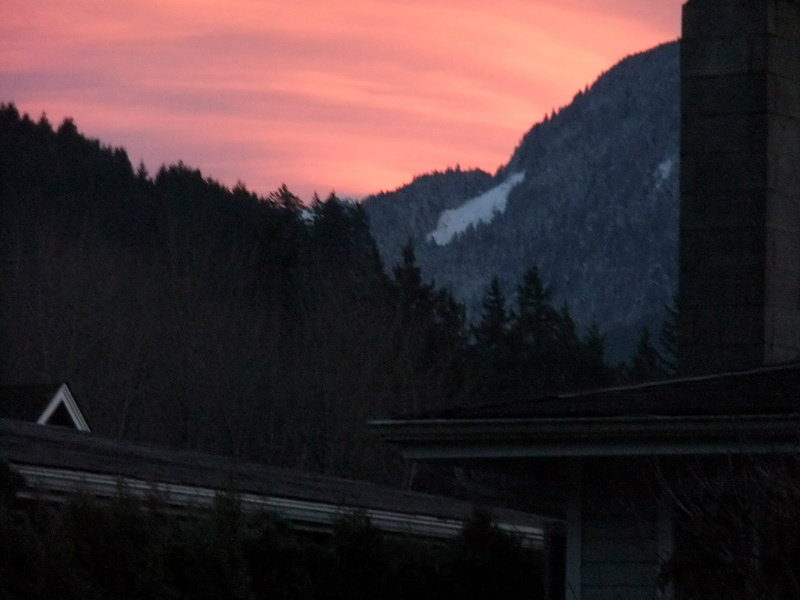 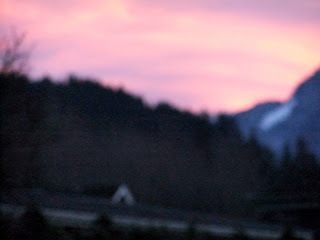 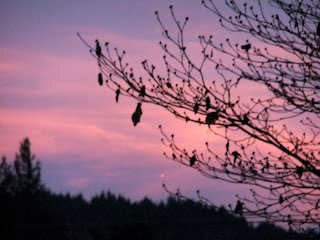 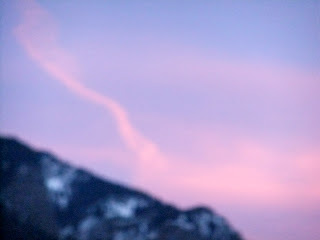 Eeeeeeks it's been almost 2 months since I posted anything so how about some gorgeous sky pics from the Fraser valley of BC, Canada taken in December. 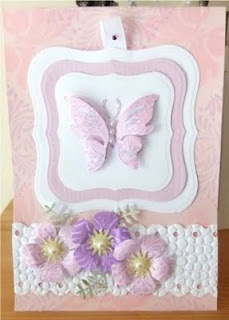 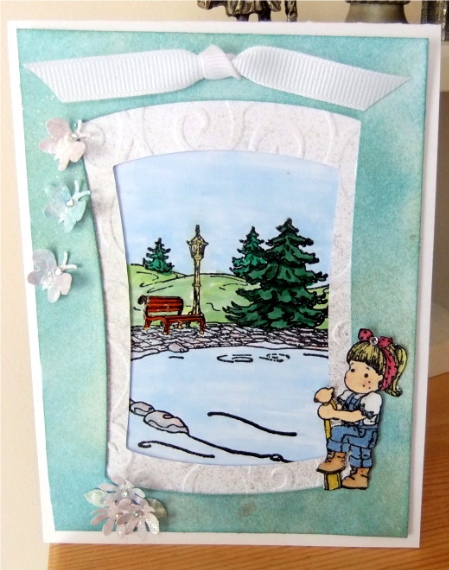 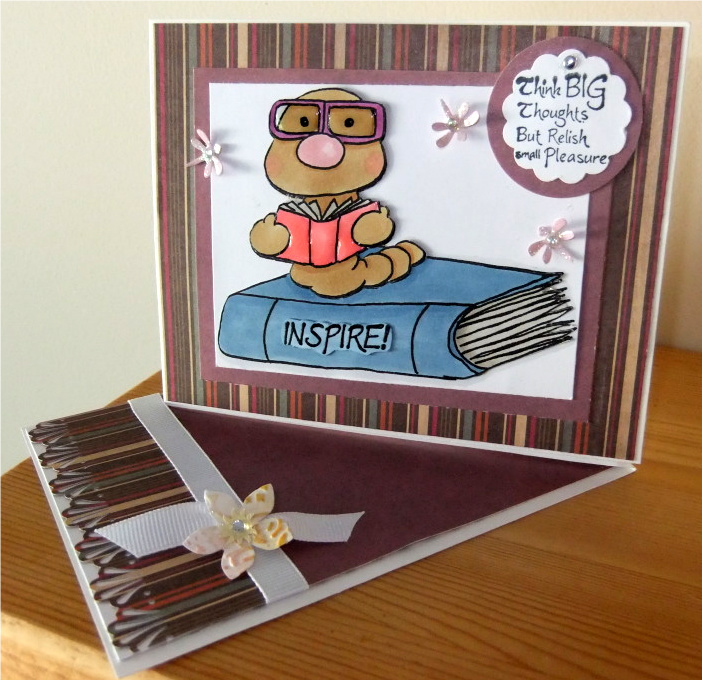 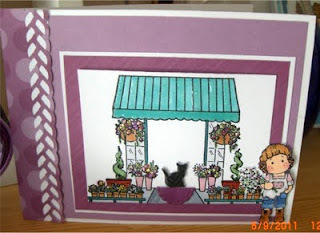 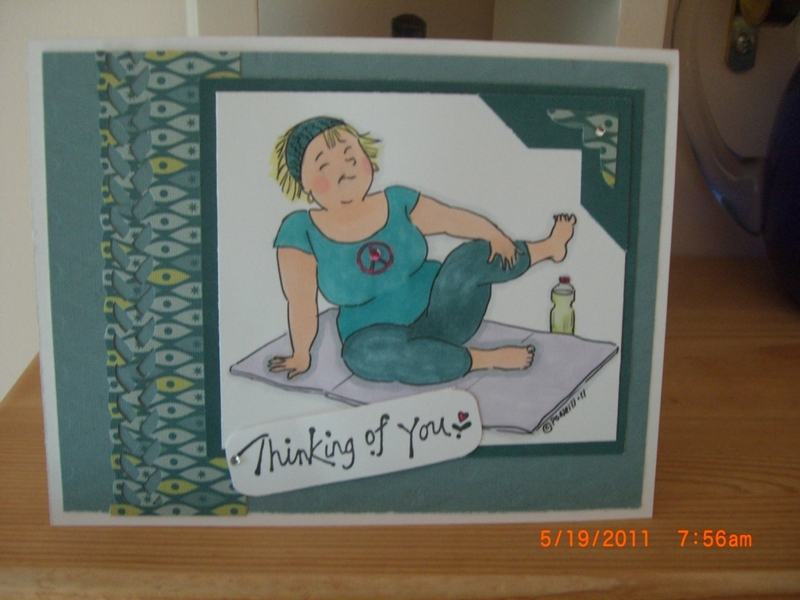 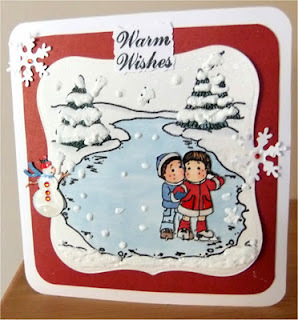 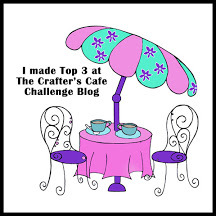 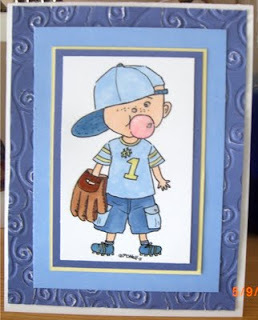 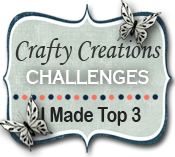 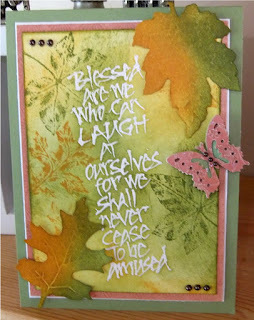 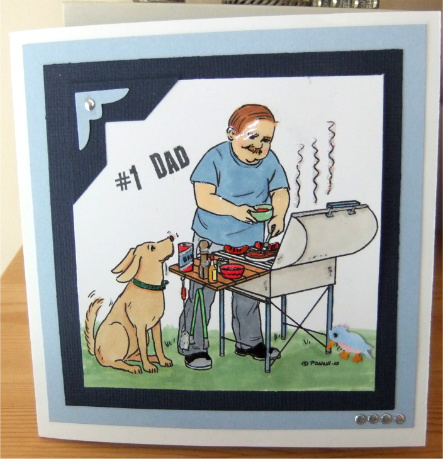 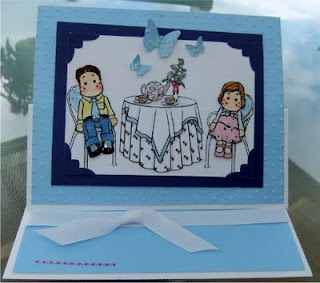 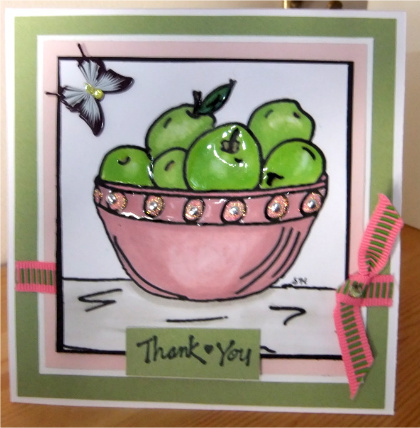 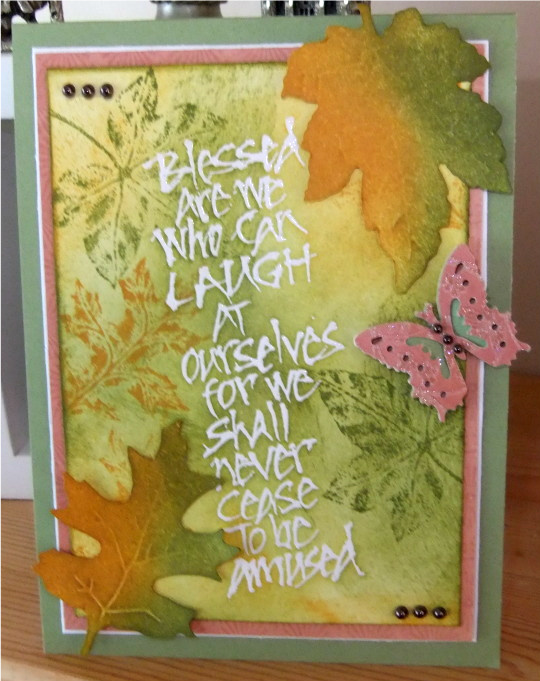 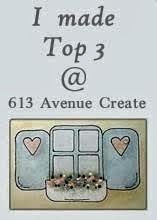 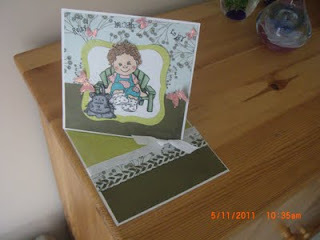 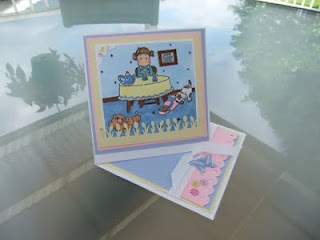 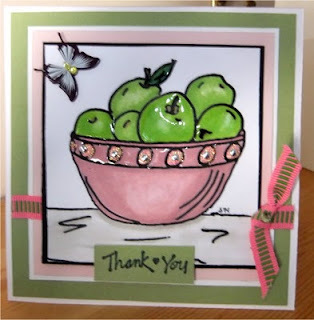 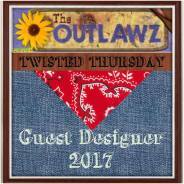 I kind of rushed this one to get it in for the challenge at Phindy's Place Blog, the challenge is piece stamping. 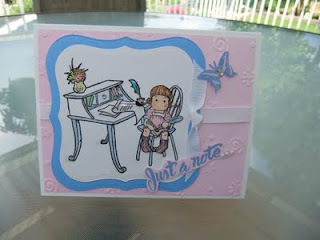 My first time doing a digi piece stamp & it was fun. 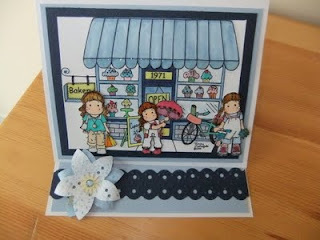 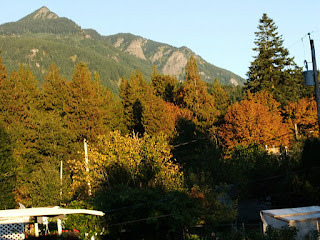 Here is the link to Phindy's store she has lots of fantastic digis. 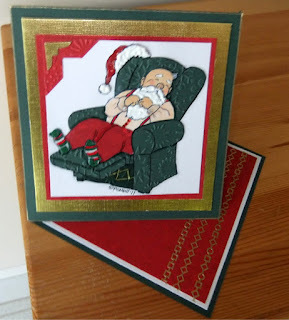 I printed the chair on green & embossed with my cuttlebug, his pants are pieced as well as his hat, colored with my Copics, some glossy accents & glitter. 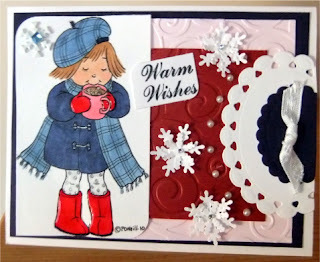 When I saw this little girl sipping her hot chocolate at Phindy's I just had to add her to my collection of digis from Phindy, she is just too adorable. 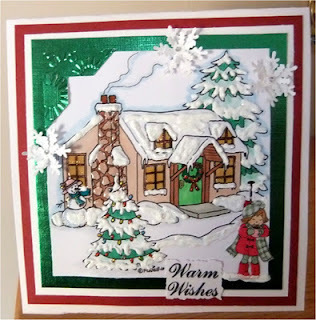 Another Phindy Digi, this winter house with the little girl in the bottom are both from Phindy. 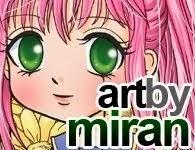 I love coloring her artwork, it is so well done. Now that I have a start with these 3 I look forward to having more fun in the snow, on my cards that is. 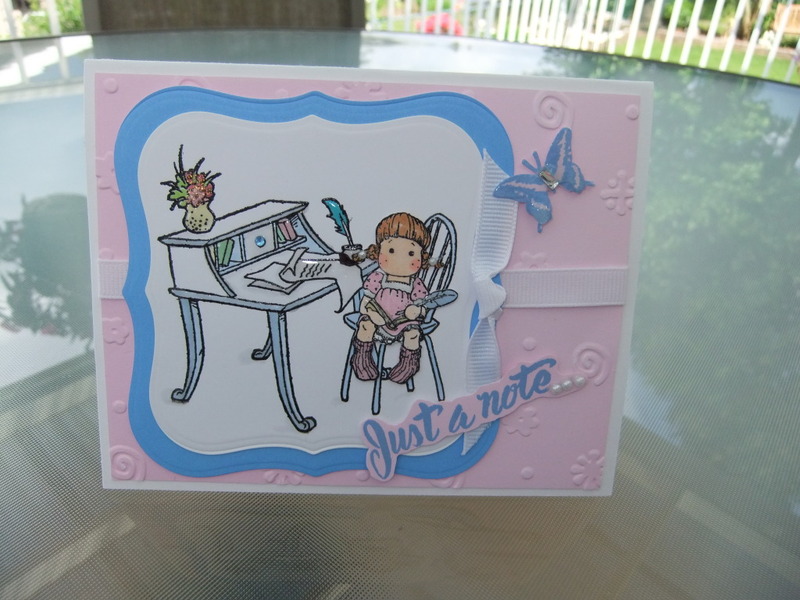 I colored this digi some time ago & finally made a card out of it. 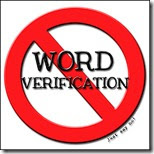 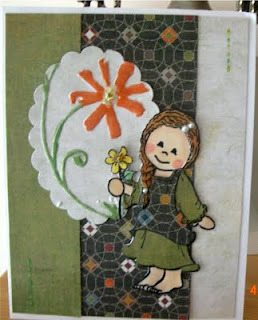 A digi from Whimsie stamps. 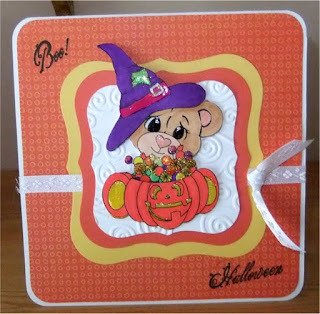 I think this image is so adorable, layered his hat & pumpkin, colored with my copics, added glossy accents & glitter. Sentiment stamps are from TAC. 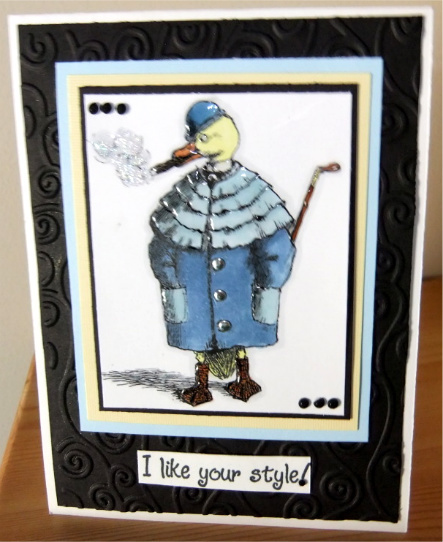 This handsome duck is a digi from Nicecranes Designs, I'm entering him as my 3rd entry for the Progressive Challenge at CDAC. He was fun to play with, colored with my Copics, added a few gems & my Glossy Accents, love that stuff. 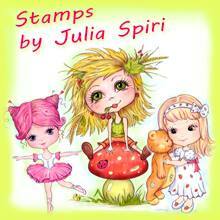 The word stamp is from High Hopes Stamps. 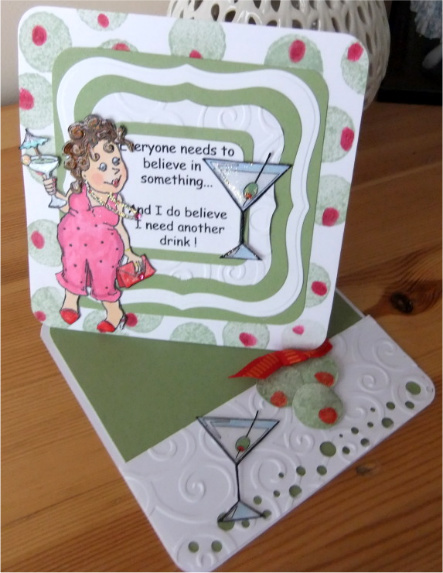 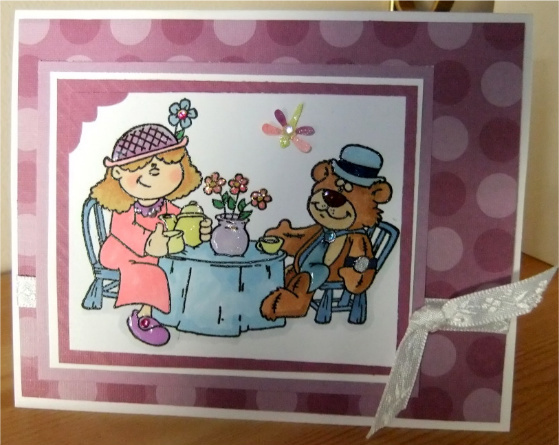 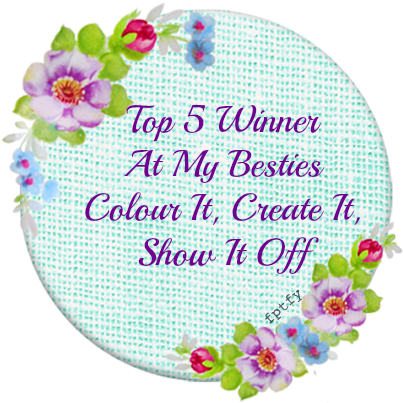 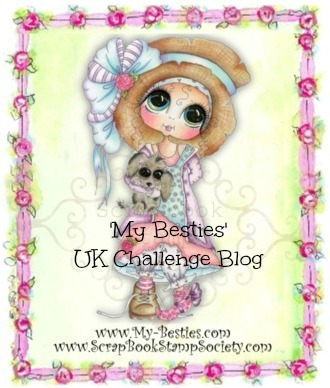 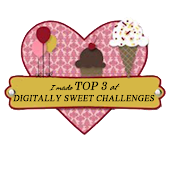 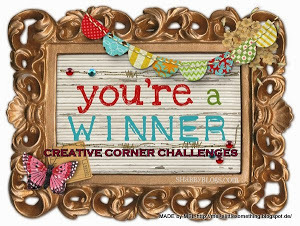 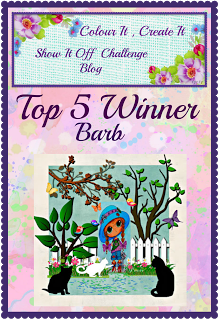 This is my second card for the CDAC Progressive Freebie Challenge, this digi is from Glitterbabes, a fun one to play with. 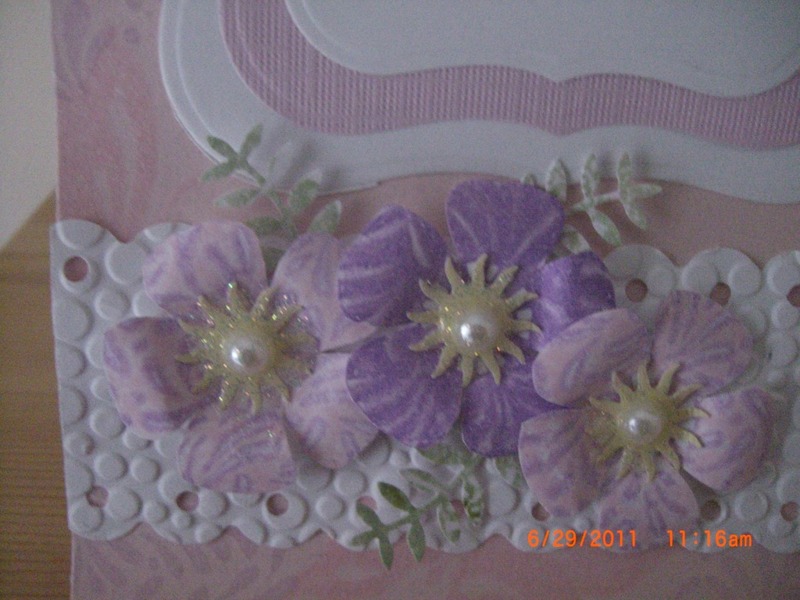 Colored with my copics, some glossy accents & a few gems to embellish. 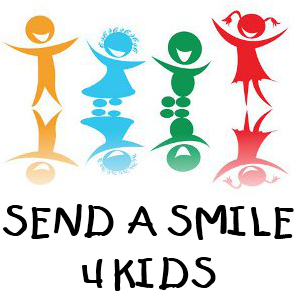 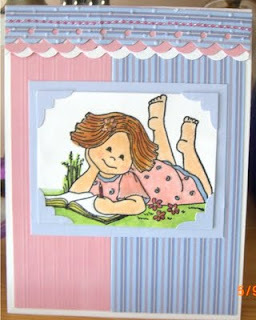 I used this image form Just Inklined for a challenge at CDAC. 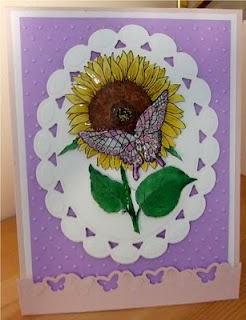 I used my copics to color, Glossy accents on the flower & butterfly, a little glitter here & there. 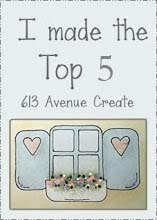 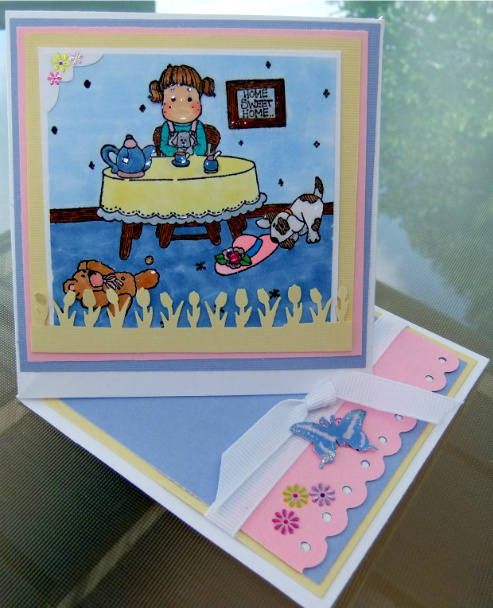 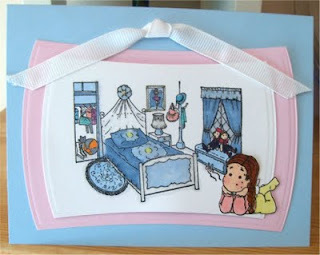 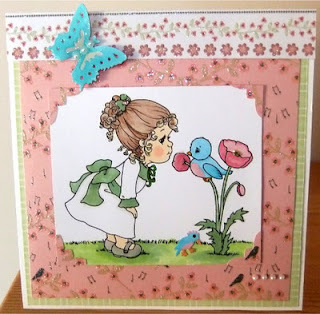 This is another adorable image from Jens digi stamps, you can visit her here to see more darling stamps. 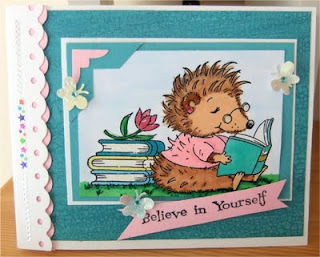 I colored with my copics, added some glossy accents, glitter & a few gems, layered with First Edition Papers. 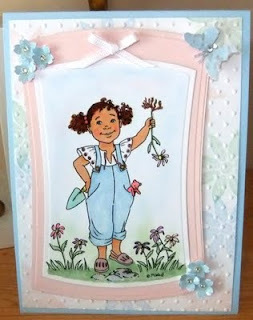 She was a true joy to color. 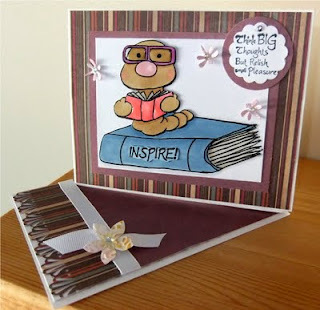 I actually have 2 large books & 3 bookworms cut & layered, colored with Copics, layered with First Edition Papers, added some Glossy Accents to his glasses & book in hands..
Another of Phindy's Digis called Squeezes, colored with Copics. 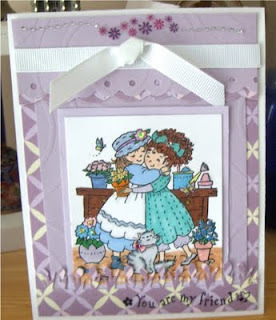 This is the "kiss" technique I haven't done this one in years but reminded of it on a challenge blog. 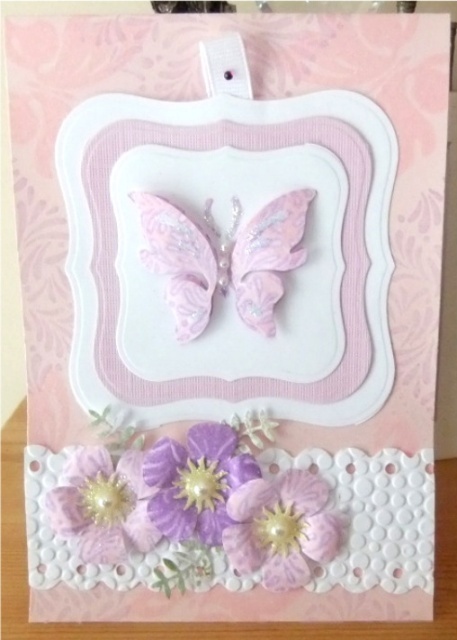 Basically I inked a solid stamp in pink (butterfly), then I inked a background leaf stamp with purple, gently let the stamps "kiss" each other, then I put the image to paper. 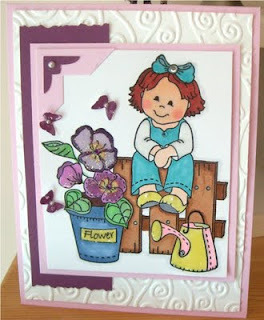 I've done the same thing with the flowers below. The background was done using both stamps individually. 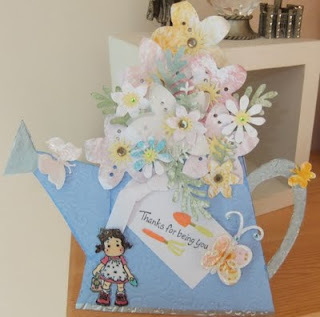 I found a free template for this watering can card, has a little piece attached to the back for adding a message & to stand the card. 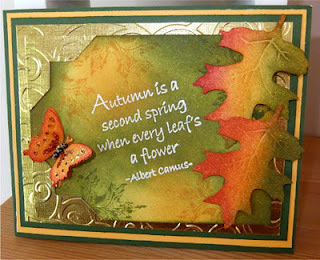 I've been playing around with distress inks, this is what I've come up with, then sprayed a little gold over it. This is my favorite car by Magnolia, I think the card still needs something.......hmmmmm Any suggestions? 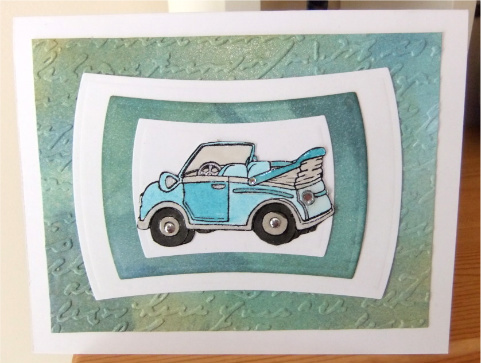 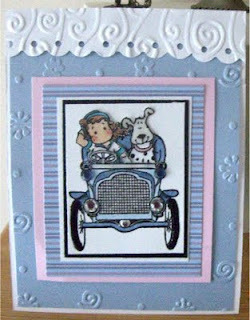 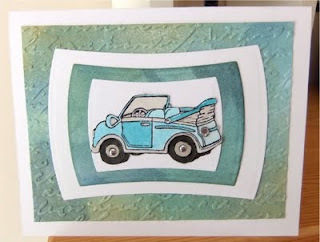 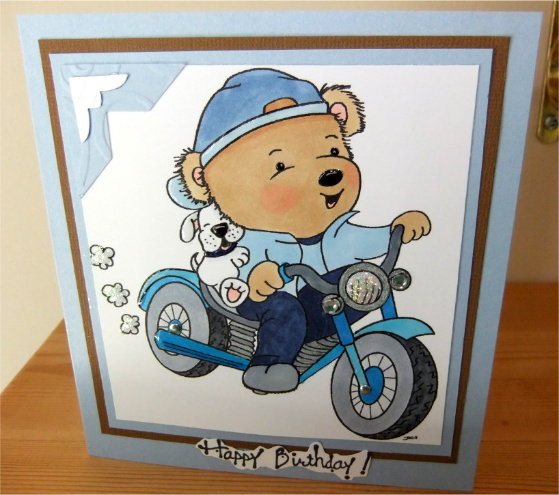 Well this was a fun card, took me forever to choose my passenger & driver but I'm pleased with both :>) The little car is from Alota of Rubber stamps, the dog is part of a Penny Black stamp & we all know where Tilda comes from. 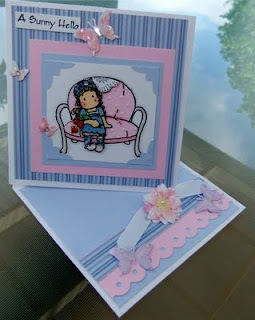 This cute little loveseat is from Alota Rubber Stamps, too cute for Tilda to sit on. I believe this little desk is from Whiff of Joy but feel free to correct me if I'm wrong. The background scene is from Digidrawn, drawn especially for Magnolia minis. 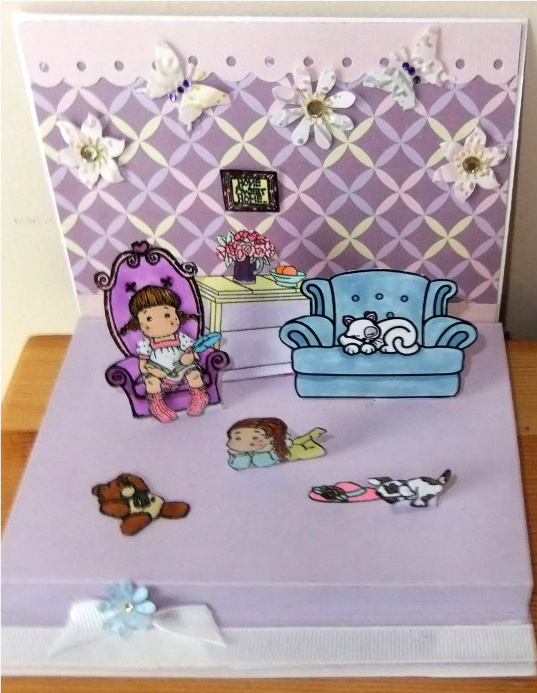 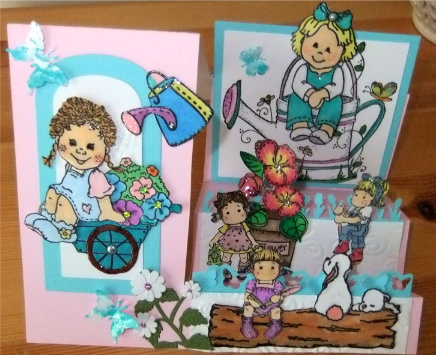 I've been having so much fun playing with my mini Magnolias, then Alota Rubber Stamps comes out with mini scenes for them & it starts all over again :>) Woohoo I still get to play with my dolls. 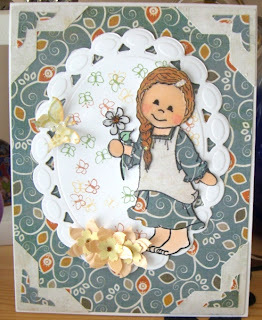 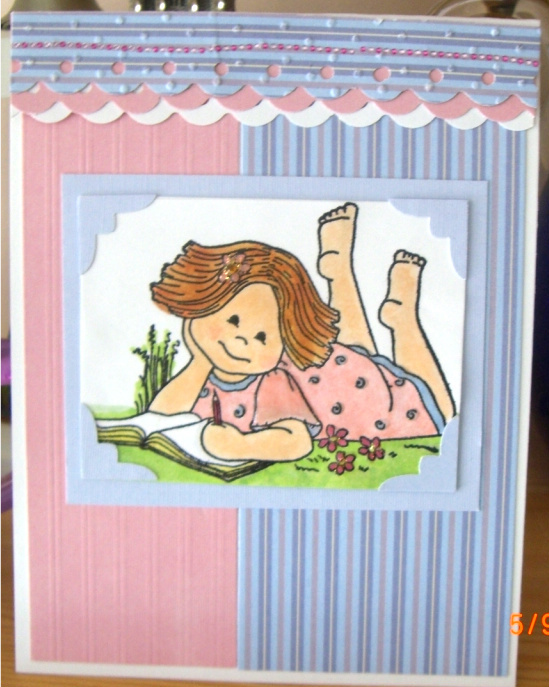 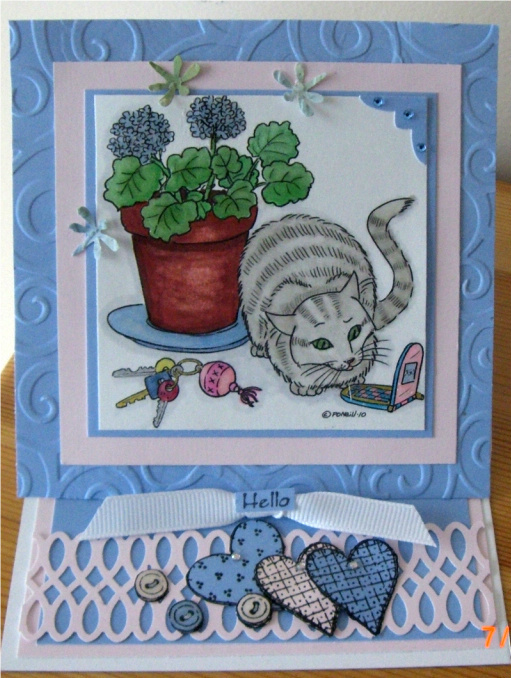 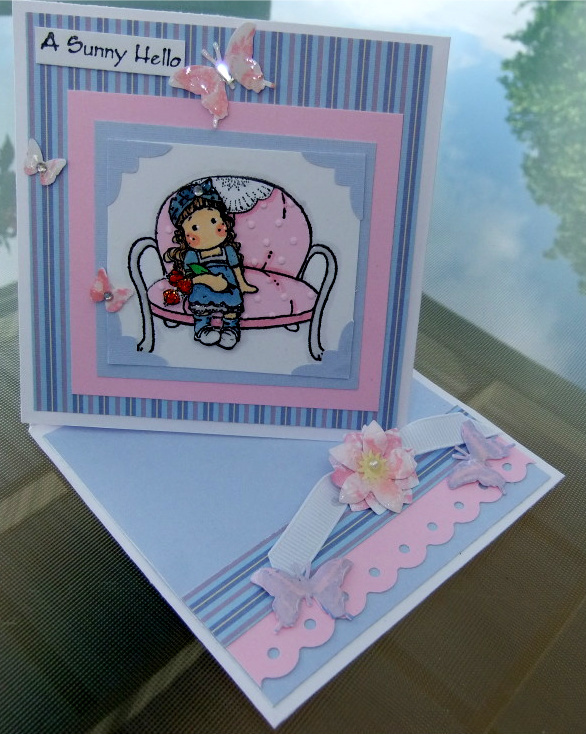 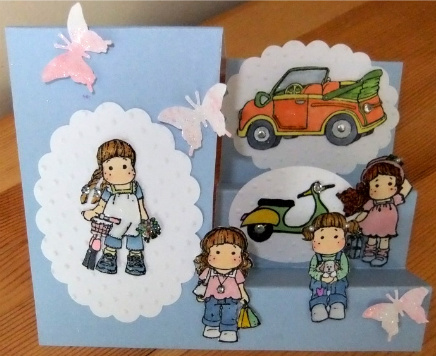 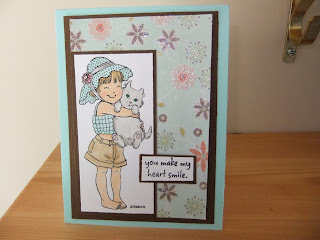 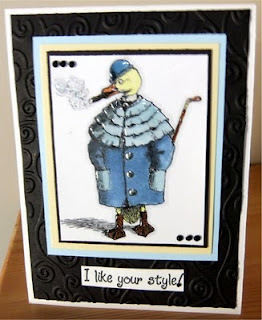 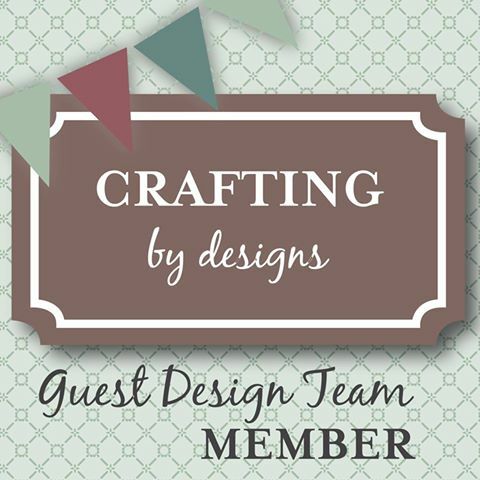 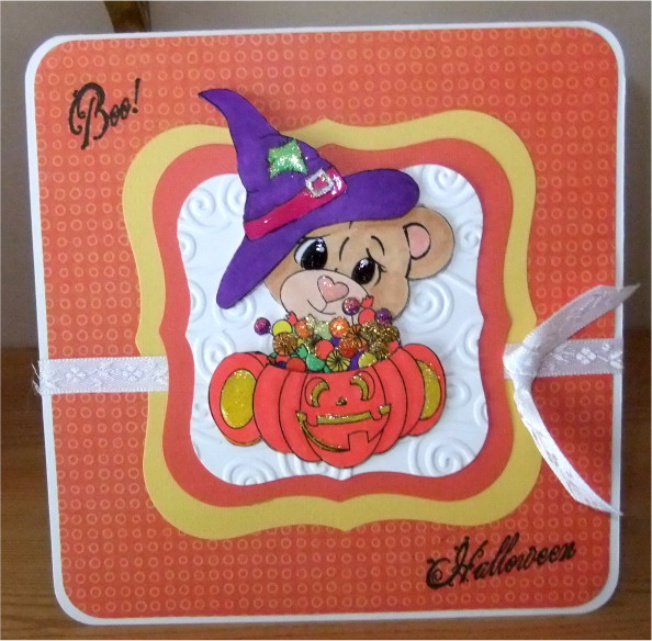 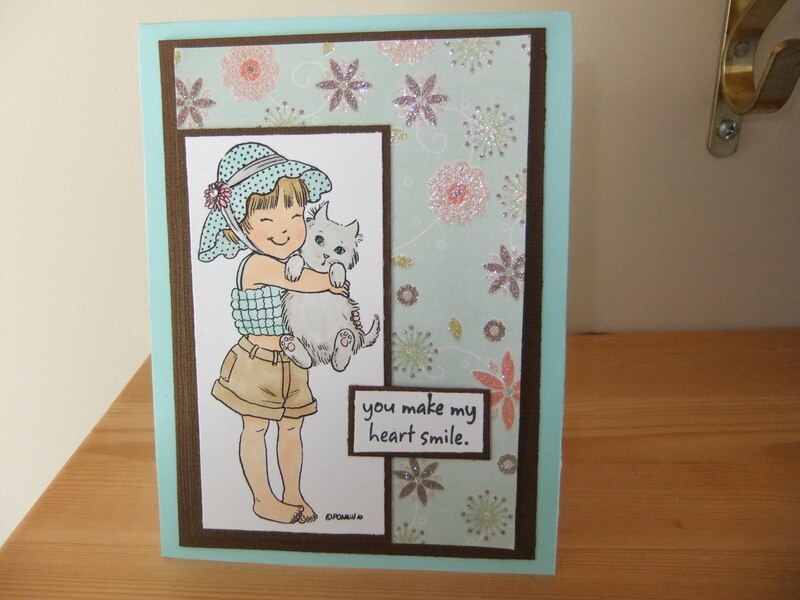 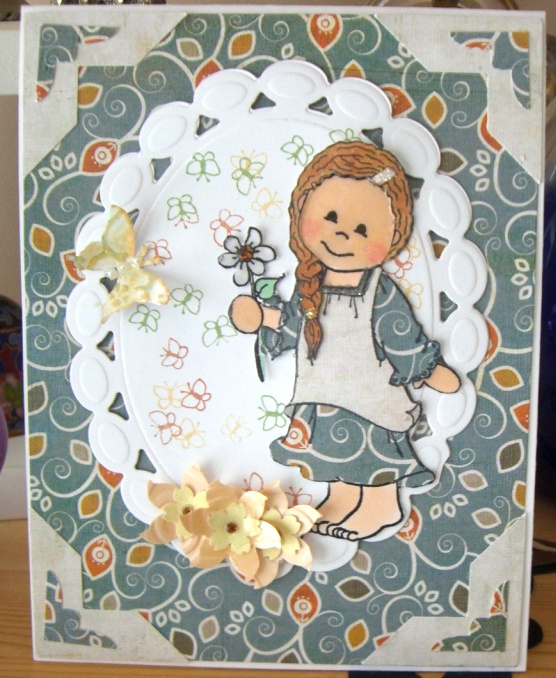 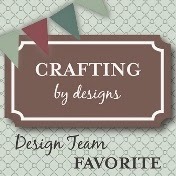 This little darling is from Bildmalarna Stamps. The bedroom scene is from Alota Rubber stamps, Tilda of course is from Magnolia.